I’m blessed to have experienced the sublime Mimosa a number of times and I can’t imagine anyone being disappointed by what they deliver consistently. Beautiful people. Beautiful music. The Mimosa Duo consists of Phoebe and Morgan Haselden on the violin and guitar. They were both trained at the Sydney Conservatorium in classical music but have been making their own way, in a big way, since their graduations in 2009. Mimosa perform numerous times a year as guest entertainers on luxury cruise lines, they have performed on the Opera House main stage, at numerous festivals and for literally hundreds of events. 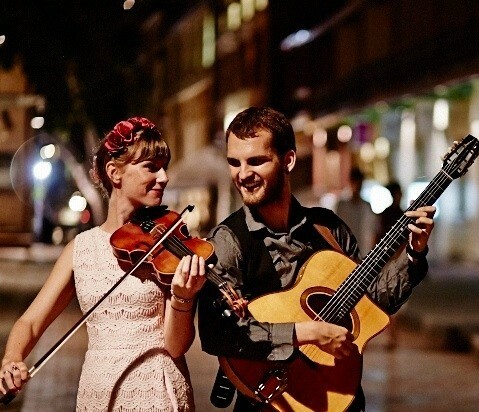 In 2014 they spent 6 months living and performing in France and searching for the heart of Gypsy Jazz, and over the years they have toured all over Australia and New Zealand. Phoebe and Morgan are fantastic musicians in their own rights both having studied with scholarships at the Conservatorium and having performed with a plethora of top notch Sydney based musicians. However, together is where they are home and you can really see the deep understanding they both have of music and of each other when they perform together. The music truely flows from their fingertips, they lock in tight and play with impeccable timing and feel. Their arrangements are interesting and unique, they highlight their own talent and the wonderful range of styles the guitar and violin can perform in. This is their 3rd time to the Nelson region, they can’t wait to see you all again, show off their new repertoire and lap up the local fresh air and craft beers.